Dorothy "Dot" Quick, 70, of Beaver Dam Road Ashland. 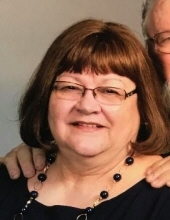 passed away Saturday, March 30th, 2019 peacefully at Geisinger Medical Center, Danville, PA.
Born in Ashland June 17,1948 the daughter of the late Irene (Guinther) Leonard. She graduated from North Schuylkill High School class of 1967,was a member of Good Shepherd Lutheran Church, Ashland ; Order of the Eastern Star, Ashland Chapter and the Ashland V.F.W. Ladies Auxiliary. Surviving are her husband of 52 years Wilmer Quick. Two daughters: Beth wife of Joseph Cataldo and Angie wife of Nelson Berger both of Ashland. Two sisters: Helen wife of Earl Heiber, Ashland and Marguerite Felegi of Quakertown, PA. Sister Eleanor Rollenhagen preceded her in death in 2010. Four grandchildren: Erin & Rachael Cataldo and Nathan & Nelson Berger. Nieces and nephews survive. Funeral Services will be held from Good Shepherd Lutheran Church, Ashland, PA, at 11:00 A.M. on Thursday, April 4th. Rev. Dana Heckman-Beil officiating. memorial contributions can be made to Good Shepherd Lutheran Church, North 9th St., Ashland, PA 17921. Kull-Heizenroth Funeral Home, Ashland is in charge of arrangements. To send flowers or a remembrance gift to the family of Dorothy "Dot" Quick, please visit our Tribute Store. "Email Address" would like to share the life celebration of Dorothy "Dot" Quick. Click on the "link" to go to share a favorite memory or leave a condolence message for the family.